Taste the difference quality makes at COWS, where all-natural ingredients, an old secret recipe and time-honoured techniques are used to create the ice cream named Canada’s Best by Reader’s Digest. What began as a small ice cream shop in Cavendish in 1983 has quickly turned into a brand as identifiable to Prince Edward Island as Anne of Green Gables. Nowadays, COWS produces more than 32 innovative flavours sold in stores across Canada but it hasn’t forgotten its humble roots, its commitment to quality or altered its decades-old secret recipe. 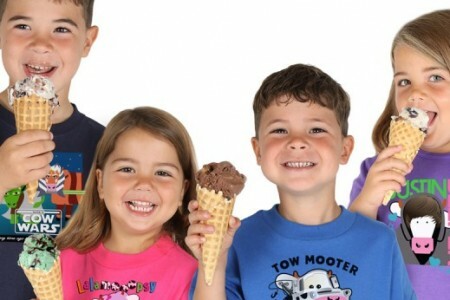 COWS uses only the finest ingredients, including fresh Prince Edward Island berries for its Strawberry ice cream, and each ice cream is served in a handmade waffle cone made one at a time right at the counter. To taste COWS ice cream is to taste PEI – humble, varied, full of surprises and a little old fashioned. Visit any of the six COWS locations on the Island and browse the extensive line of COWS T-shirts featuring pop culture cow puns that have become hugely popular PEI souveniers. Adults will love shirts like “Farm Night” and “Ham Solo”, while kids will beeline for “Incredibulls” and “P J Moosks” shirts. COWS also offers a number of dairy products including COWS Butter, COWS Extra Old cheddar, Avonlea Clothbound Cheddar and COWS Applewood Smoked Cheddar. With COWS locations in Borden-Carleton as you come off the Confederation Bridge, and on the MV Confederation ferry as you approach Wood Islands, tasting COWS ice cream can be the first thing you do on PEI! Island Insiders are divided on the best flavour, but Gooey Mooey, Wowie Cowie and Moo Crunch are all highly recommended.